Before you tune me out at the mere mention of the word "workbooks" in relation to homeschooling, I'll have to confess, I, too, am anti-workbook. They go against my core beliefs of how to best foster individualized, self-motivated learning. They are the GO TO resource for the factory model of education. They promote a 2-dimensial, black-and-white way of learning. I get it! I believe it! at the risk of sounding like a total turn-coat to the entire homeschool movement, I must admit, I USE WORKBOOKS in my homeschool. Let me first start by disclosing that not only did I teach in a very traditional, workbook-driven classroom for several years, I was also employed for a time in the homeschool division of one of the leading Christian workbook-based curriculums, ABeka Book. And while you might assume that it is because of these experiences that I use workbooks in my homeschool. On the contrary, it is in spite of them. It was during those "workbook" years, that I learned the truth about workbooks. The truth is, in most curriculums, workbooks are designed to compliment the teaching portion of the lesson. Let me repeat that: workbooks are designed to compliment. Compliment...not be the lesson. There's a difference. The framework of any math or language lesson (I use these two subjects as examples because they comprise the majority of workbook texts.) should be teacher/student interaction in the form of games, manipulatives, real-life examples...not a page of black-and-white questions torn from a workbook. The workbook page is merely an easy method of review. A means to measure whether the material learned can be put into practice. For this reason, they are perfect for classroom learning. A classroom teacher does not necessarily have the time to have individualized practice with each and every student to see if the knowledge has been mastered. And if we are all being perfectly honest, workbooks are designed to "manage" the wide-spread learning abilities of a large classroom. Children start the school year off at varying degrees of knowledge. Much review of very basic information has to happen at the beginning of the year in order to get everyone to the same spot in the curriculum. (The first one-fourth of the entire school year is usually just a regurgitation of the previous one.) In addition, throughout the year, the gifted children need some "extra" to "occupy" while the classroom teacher works with struggling learners. And the struggling learners need a few additional problems to practice in order to "master," and so the lengthy worksheet with its never-ending supply of repetitive questions is the perfect solution! why, then, do I choose to use workbooks in my homeschool? The answer is simple...just because those are the how's and why's that a classroom teacher might use workbooks does not mean they have to be my how's and why's. 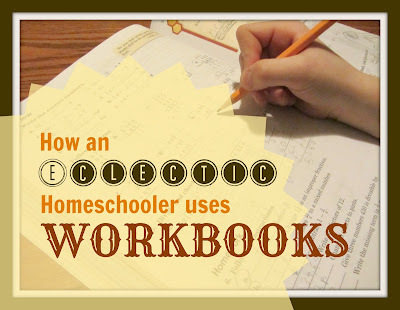 So, here's how one eclectic homeschooler (that would be me) uses workbooks in homeschooling. I never use a workbook to teach. Its sole reason for "being" is for review/practice. I do not assign every page of the workbook. Many days it is unnecessary and redundant. I think we have already established that a workbook is for practice. That being said, if I see that the concept has already been mastered, why would I need to assign "practice?" If my child does poorly on the 3 or 4 assigned problems within each section of the page, I can reteach the material or use the remaining problems in the section for further review. It is not unusual for me to skip the entire front or back pages of a workbook. I know my children. I know what they know and what they don't. If the first 20 pages of a phonics workbook are simply a review of the alphabet and my child is already reading one-vowel words, why would I waste his/her time, and my time, with worksheets that review the ABCs??! Or if the back fourth of the workbook is merely a long-standing review section, and he/she has already proven mastery, what would be the point of the review? Workbooks are an easy, no-fuss way of providing a review of learned material. Yes, I can create example problems for my child to work on, but why would I want to? I don't need to "invent the wheel" when someone else has already done so in the form of a workbook. My time is too valuable. The more children/grade levels you teach, the more corners you have to cut in order to squeeze it all in. I'd rather spend my time creating wonderfully engaging units and hands-on activities than devising my own subject/verb agreement charts and review sentences. If I have a harried homeschool day. Let's be honest, as a mom of five kids, all my homeschool days are harried. So, let me rephrase: if I have an unusually harried homeschool day and find myself carting my brood to one appointment after another, I can rest in the knowledge that the school day was not a complete loss. My children can still accomplish the bare basics by completing a simple worksheet in a waiting room. While I think that science, history, Bible, and most extra curriculars are designed to be learned through enriching literature and engaging projects, Math and Grammar are sometimes best learned in black-and-white. They are rules-based subjects that have to be learned in a concrete, sequential order. A workbook generally follows the natural order of a sequential subject. I think that workbooks, when used in moderation, can be a nice compliment to a thorough teaching time. I realize that I have stuck my neck waaaaay out in support of a taboo form of homeschooling, but it is with much conviction that I support the use of workbooks in homeschooling knowing that not only do some students learn best with this type of educational method, but that some teacher-mommas teach best with them as well. (I can fill a math or language lesson with all the "jazz hands" I can muster, and my daughter would still prefer to just do the workbook. She's a Type A, first-born and thrives on the "concrete." And so, I've embraced that need she has to see a black-and-white, right-or-wrong answer on a page because I was a workbook girl, myself, as a child.) And isn't that a great part about homeschooling? We each can tailor all of our learning/teaching to our home. What's taboo for one, might be tailor-made for another! And how about you? Do you have a secret stash of workbooks on your homeschool shelf? My six year old much prefers workbooks for maths. We use plenty of games but she actually enjoys sitting down and filling in a sheet. For her, the biggest disaster in our maths lessons was when I tried to use a very popular, story based maths book. She was so much happier when I pulled out the worksheets! It sounds like our daughters are a lot alike. I've never used story based math with her, but even games and fun manipulatives get passed over for a worksheet. It's just how she's wired, and I've embraced it. I, personally, love workbooks, but it's because I am on the go so much of the time. We also did buy the SW Advantage software as well. $120 and we've barely used it. I need to get on getting her to using it for the price we paid. I think I will be more concerned with that next year though, her last year with me. 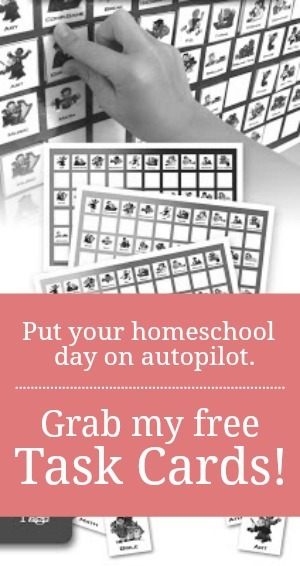 I'm a just starting out homeschool momma. I love workbooks as I get my feet under me. They give me the basics and since my oldest is a Kindergardener it's nice to know I'm not missing anything. This year we only used them for math, we're learning to read and that's not really workbookable, and we used them some to help her form her letters. We'll probably use some grammar and vocabulary workbooks in high school (gasp, I know) Because I saw a huge improvement in my SAT scores from one time to the next because of those (stupid, busy-work, insert derogatory comment here) workbooks. There is something to be said for drilling the concepts and practicing even once the skill is mastered. I always recommend that new homeschool mommas start off with a more workbook based curriculum for math and language. Like you said, it provides and opportunity to get your feet wet while still being quite manageable and clearly laid out. It sounds like you we have a similar opinion. Workbooks get such a bad wrap from many homeschoolers, but they have sure been a blessing to me and my family during different seasons of homeschooling! We happily use workbooks. They save my sanity (not to mention that my kids seem to do very well with them). I can be creative...sometimes...and other times, we just need a good workbook to go through! "Save my sanity." Totally agree! Agreed! We use the Charlotte Mason method which means textbooks and workbooks are not the "norm" here. But they do exist. I do use them here and there. Workbooks can be used, as you stated, to practice. Textbooks can be used as a reference, resource or spine. Completely agree. Sometimes we as homeschoolers are so busy critiquing what other homeschoolers are using that we forget our mantra that homeschooling is UNIQUE for every student. Just because the homeschooler across the street doesn't find the value in workbooks doesn't mean I should feel bad for using them if they work for me and my kids. Isn't that why we all homeschool...because we know OUR kids?! I consider myself eclectic also because I use many different curriculum and forms of teaching. My resources come from many areas. Workbooks and using one curriculum is the norm for the people in my homeschool group. I mix work books and hands on. Whatever works I use lol. So I've never thought of workbooks as being taboo. My son (one and only child) is finishing up second grade. Don't fret about not having a degree. You are your son's mom and that trumps a piece of paper EVERY TIME! Sometimes I think my degree is more of a hindrance than a help. And besides, as you said, it is not possible for even a classroom teacher to have a degree to cover EVERYTHING there is to know about EVERYTHING. In the end, every teacher has to rely on curriculum or a book of some kind. I am glad to have come across this post. We are new to homeschooling and are starting out with a lot of workbooks mostly because I don't really know what they should be learning at this moment. This wouldn't be a big deal but we live in a testing state and I don't want them to fall behind in something that would cause problems with that. I have been studying up on lapbooks and units or creative ways to teach besides workbooks but for this first year they will be our life saver as we spend this time learning the ups and downs of teaching at home. I will never be able to be an unschool teacher here but given time I would like to take the focus off the workbooks. I think that starting with workbooks is great way to get your feet wet. Then as you become more familiar with homeschooling, you can add in a few extras. To me, workbooks can be freeing. They give you a nice frame of reference of what you should be covering and when. I hope you have a great first year. You can do it! I use workbooks because we are a literate society and someday my child like all children will be required to respond in writing to a question whether on a health form or on a job application/test. I have never heard of an employer asking an applicant to play a game or put on a play to check for their competence. These are nice things to do when they are young, but our job is to prepare them for the real world.